‘Art - An Accumulation of Mistakes’ is a collaboration between WÜL - Elena Ceretti Stein, an Italian-Israeli visual artist - and Belle & Sue, the local fashion store. 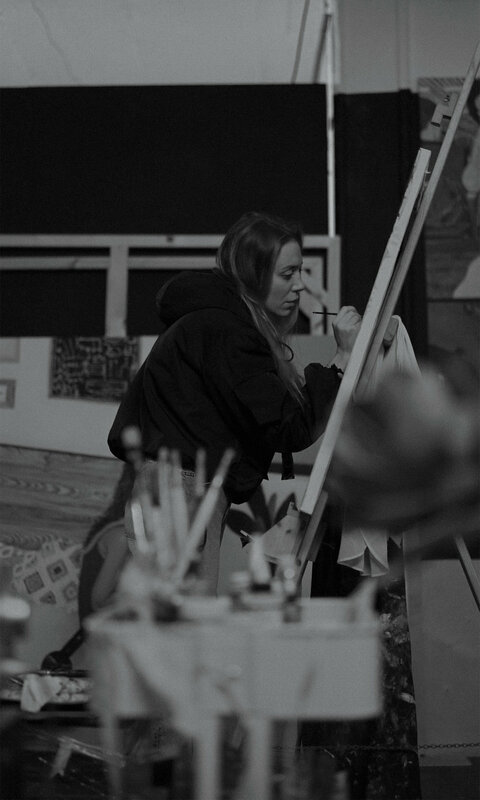 Elena is a multi-disciplinary artist with a philosophical approach to existence as a creator. She was born in Milan, moved to London where she graduated from the University of the Arts, eventually moving again, this time to Tel-Aviv to enable yet another step in self-development and self-realization. We decided to visit Elena in her art studio in South Tel-Aviv, Kiryat HaMelacha neighborhood, the hive of contemporary, emerging young artists and speak about inspiration, the empty spaces, and the symphony of creation. 2 days we’ve been filming the studio and the surrounding area, speaking with Elena about her art, watching her paint, reorganizing the studio, and dismantling the remains of the irrelevant plaster sculpture. "it's not about fixing your holes. It's about making them beautiful." Sculptures and installations as a part of Elena’s work create a reality in which the symbolic elements, the feared and the desired, merge to disturbing and strangely attractive objects. Unnerving and vibrant color schemes signify a viable and animated state of existence. Elena ponders on her creation bringing in additional deep layers of thorough thoughts and complicated reflection in a constant attempt to disclose something beyond the rules of nature. The result often emerges as poetic plasticity which comprises a combination of soft textures and shapes blended with industrial materials. "I want to cheat death in my own way. Looking for light in the most unexpected places. Chasing the sky suddenly showing through the cracks of a soul. Exposing the fragility, the naked knots." "You need to be extremely honest, and this is the thing that’s worth way more than inspiration for an artist. Find honesty, find the truth even if it hurts, even if it is something that is hard to confront or face. Try to find a way to say it. Try to find a visual answer to questions." "I’m not interested in things that are simply pretty. Although this is not trying to say that there is no such a thing as objective beauty or harmony in the world, on the contrary, I use very vibrant colors to create my composition in a harmonic way. I’m not trying to deconstruct that, I’m trying to get beyond that.